This is what passes for traffic in Isaan. Water buffalo ambling down the main highway through town. 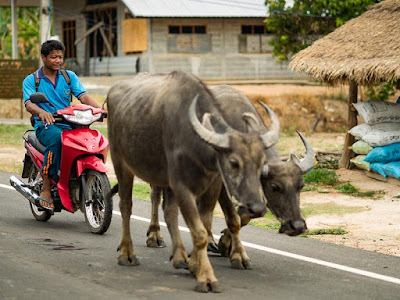 There was a time when water buffalo were the main beast of burden for Thai farmers. That time was decades ago. Now most Thai farmers are mechanized. Their tractors aren't as state of the art as the high tech behemoths used by American farmers, in fact Thai tractors tend to be jerry-rigged contraptions that are slow and loud but also cheap and durable. Rice and sugar cane are harvested by machines that look like a cross between an American combine and a zamboni. As a result very few Thai farmers still use water buffalo in their day to day lives. But many farmers still keep water buffalo around and they are are still a common site in Thai fields. The further you go from Bangkok, the more buffalo you'll see. Farmers sometimes use the water buffalo for recreation (water buffalo racing) and they're a source of protein (meat). These two were on a country road about six hours from Bangkok.